Kulla is the web platform that captures all the data gathered by our mobile apps. Whenever you tap the "Export" button in an app, the information gets beamed into Kulla and you can then log in to review it. Kulla's URL is https://app.kullasoft.com - you can type this into a your web browser's address bar or use the gray login/signup buttons in the navigation bar above to get to it. 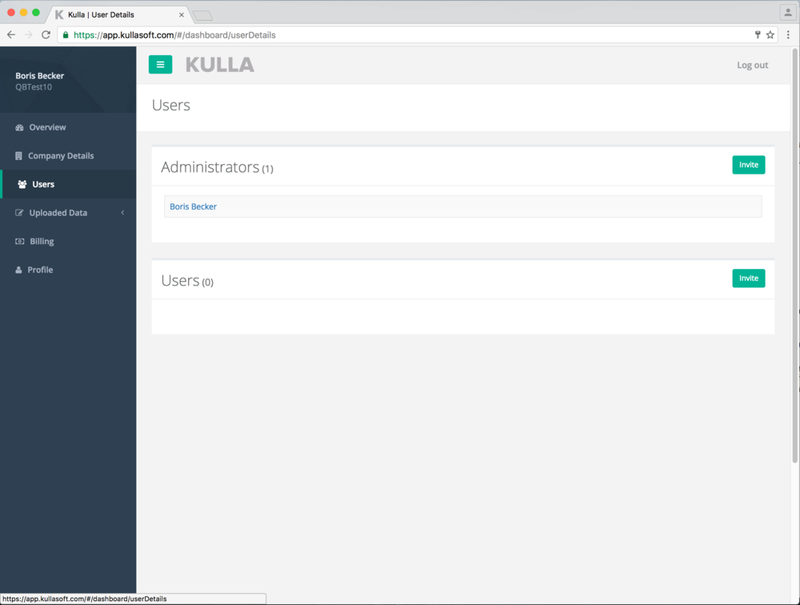 As with many other online systems, users of Kulla need to create an account with a username and password so they can log in and out. These accounts are free to create. There are two types of account - Administrator and User. Administrators have full access to all areas of Kulla and can set up and edit company details, invite other users, change the roles of users, see summaries of uploads, access billing information and so on. The User role has more restricted access which is limited to mainly uploading data from apps and logging in to see the information. At the beginning of the setup process, an Administrator will create an account and enter some company details. Once that's done, the Administrator can invite more users of either role to join that company. There is no limit to the number of accounts linked to a company, accounts can be linked to more than one company, and Administrators can remove accounts from a company if required. Users who are invited to join your company will receive an email invitation with a link for them to either create an account or, if they're Kulla users already, log in and accept the invitation. A Kulla account (either User or Administrator) is required to be able to export data from our mobile apps. There are no monthly subscriptions or per-user charges and there is no time limit on trying out the system for free - see the pricing page for more details. 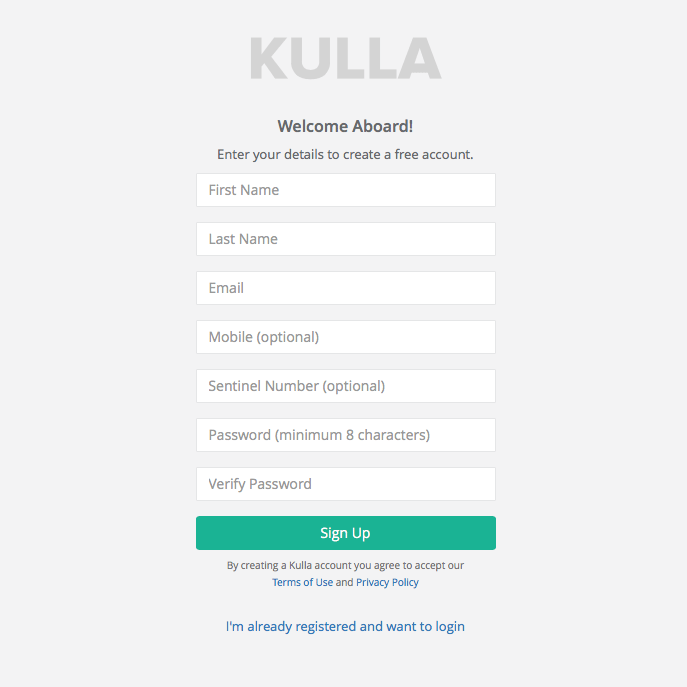 As mentioned above, users of Kulla need to create an account with a username and password so they can log in and out. If you're the first person from your organisation to use Kulla, then you'll need to enter your company details after you first register. To get started, go to the Signup Page and enter your name and email address. Choose and verify a password of at least 8 characters. If everything was ok, you will be taken to the company registration page. Enter your company details in the text fields provided. You don't have to enter everything right now - it can be edited later. These details are used for custom export templates and invoicing. Once you're done, click the "Save Details" button. You have now set up Kulla for your company and will see a number of options in the blue navigation area down the left hand side of the screen. At this stage, feel free to download the PGM Manager app and use it to upload some data. You'll be able to see what you exported by clicking on the "Uploaded Data" option in the navigation down the left hand side. If you have other people in your organisation you would like to use Kulla, you can invite them using their email address. Click on the "Users" option in the left hand navigation area. In here you will see your own name as you are the sole Administrator for the company at the moment. Depending on whether you want to invite other Administrators or Users, click on the "Invite" button in the relevant section and enter the email address of the invitee. When they accept your invitation and create their own accounts, the names of the people you invited will appear in this area of Kulla. As an Administrator you can change somebody's role from User to Administrator and vice versa, and also remove them from your company as well (this doesn't delete their account - it just means that when they log in they can't see any of your company information). You are now ready for you and your colleagues to start uploading data from mobile apps and doing useful things with it. You can learn about how data from our PGM Manager app is displayed, manipulated and exported in Kulla by visiting the PGM Manager page.